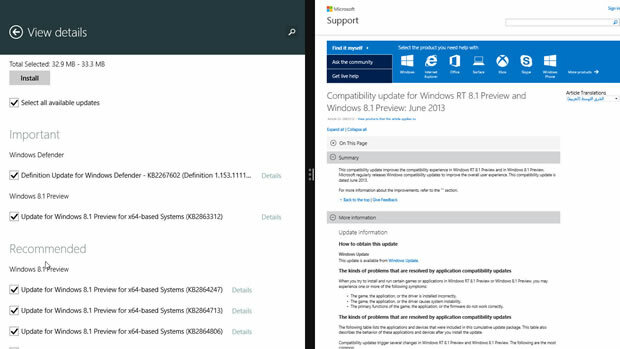 If you’re already running the Windows 8.1 Preview or Windows RT 8.1 Preview, then be sure to check for updates under the Updates & Recovery section of the PC Settings. If you have Automatic Updates turned on, then these updates will install themselves, and probably prompt you to reboot. These updates include a number of bug fixes with Windows 8.1 Preview and Internet Explorer 11. Two of the updates are flagged as Important, while the other four are Recommended. One of the important updates is simply a virus definition update for Windows Defender, the default security program for Windows 8 and 8.1. The other update improves the compatibility between Windows 8.1 and several third-party programs, such as AutoCAD, Parallels Desktop, Norton security software, and AVG Internet Security. Among the four recommended updates, the first one fixes a problem with Windows Store apps crashing upon launch. The second one says it “improves the robustness of data files in Windows 8.1” but doesn’t indicate exactly what that means. The third update resolves a bug that prevented Google account holders from signing in through certain applications. And the final update addresses an issue that kept IE 11 users from resuming file downloads.